Casa familiar privada em uma ótima localização, perto das principais atracções. Árhvammur, está localizado perto da famosa piscina Laugaskarð em Hveragerði, uma cidade geotérmica única, a apenas 45 km de Reykjavík. A casa é de 200 m2 (2153 pés quadrados) com uma área familiar / cozinha aberta. Possui 4 quartos espaçosos (acomoda 10 facilmente) e 3 banheiros. 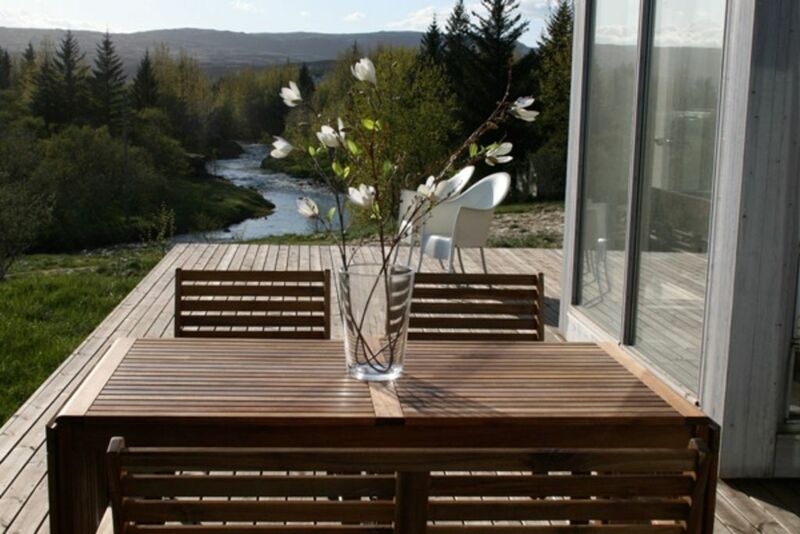 O deck espaçoso é maravilhoso para diversão ao ar livre, bem como a propriedade em si, que é 11400 m2 (123.000 pés quadrados) ou (2. 82 acres). banheiro com chuveiro e pia, mas sem toilette. Chuveiro espaçoso e um com uma grande banheira. 6 Há alguns colchões extras para serem usados ​​também. Há wi-fi / internet na casa. A casa fica em um terreno privado com muito estacionamento em frente a ela. Demora 30 minutos de carro de Reykjavik para Hveragerði. Perto de muitas grandes atrações e um lugar maravilhoso para passeios de um dia de aventura. Grandes casas de banho confortáveis. Amazing House in the country! We had 4 adults and two kids and we love, love loved this place. The house was spacious and very well appointed and decorated. The main "great room" was perfect for the kids and adults to hang out and unwind, and since the house was large no one ever felt on top of each other. The location was great. Right down the street from the community thermal pool. We bought a 10 pass ticket and ended each day with a swim and dip in the hot tub. Thank you for a beautiful review I am so glad you loved our house and the area around. We had four couples sharing this house. The kitchen was well stocked, the beds and furniture were comfortable, and the house was clean. The view of the stream in the back was beautiful. Kristen (the owner) was very helpful. There is a natural geothermal stream that is about an hour hike away. I would recommend this property to my family and friends. Thank you Kristin for sharing this home with us. Spacious, immaculate, well equipped, very well located. Our three generation family of six had a great 8 day stay. Restaurants, grocery, local fish market (cooked fresh fish on the grill) all nearby. You will be in the car for long periods in order to see Iceland's sights. Nice to have something special to come home to. You are so welcome and I am glad that you and your family enjoyed our house and our little town Hveragerdi while travelling in Iceland. This home and location were a perfect fit for our family of 10, ranging in age from 5 to 82. Every one had space and the kitchen, dining area and family room provided gathering areas. The kitchen was more than well-equipped, there were toys and games suitable for boys or girls, the bedroom and bathroom arrangements suited our needs. The home at the end of a private driveway provided serenity, the lawn was great for running and play, the nearby river made soothing sounds. The town of Hveragerdi was a welcoming small town strategically located for day trips to the Golden Circle, Reykjavik, the Blue Lagoon, a variety of museums and other southern Icelandic places of interest. We knew Iceland would be a fascinating place to visit, it exceeded our expectations and provided memories to last a lifetime. This house was just perfect with an amazing view. Our family of 10 thoroughly enjoyed it and had plenty of room. We cooked daily and the kitchen was well stocked. Perfect location for all major tourist spots. The homeowner was over the top friendly and helpful. We loved the little touches in the house and it really was perfect for our evening gatherings for dinner and conversations. I would highly recommend this place!! Thank you so much for a wonderful and a happy review. I am so glad you liked your stay in our house.